Check out their fun wedding video as filmed by Colors & Co. And don't forget! 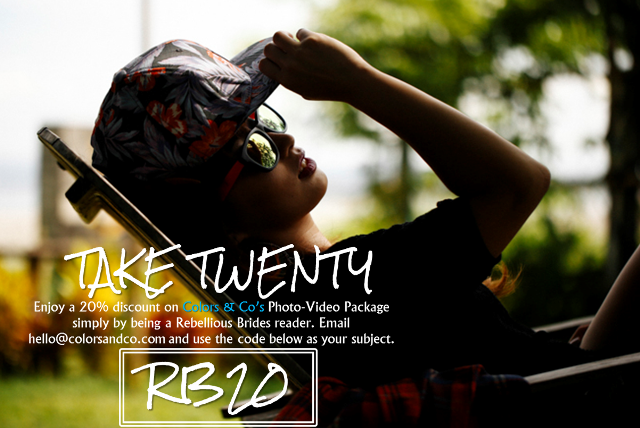 We have an exclusive 20% off discount for all you rebel readers who would want to avail of their photo & video services! JP and SHEMAH from colors and co on Vimeo. A professional wedding videography are created not by simply capturing the event however conjointly lots of post production work are done like redaction the visuals, adding music, golf shot graphics, adding titles etc and within the finish it's sensible sort of a picture, for more information click here Jacksonville videographer.